The fact that she’s had a lot of birthdays doesn’t mean Jennie should stay quietly at home. 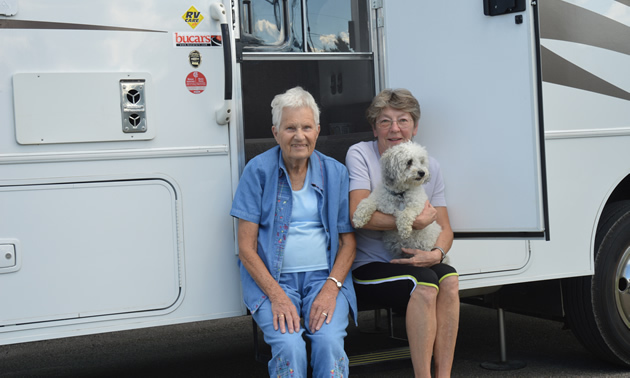 Not many 84 year olds would drive an RV, much less buy themselves a new one, but Jennie Zacharuk of Calgary, Alberta, is an exceptional woman. 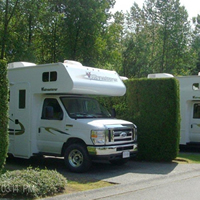 In June 2014, she bought a 27-foot Sunstar Itasca by Winnebago, and in late July she drove it to Fairmont Hot Springs RV Resort in southeastern B.C. Can you tell me why you bought your RV? 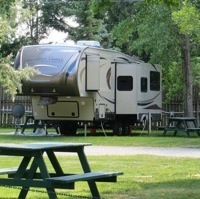 My husband and I did lots of RVing over the years, all over Canada and the United States. He passed away a few years ago and I eventually decided I wanted to go RVing again. Our old RV was falling apart, so I bought this one. What did your family have to say about your purchase? Oh, my family and friends all said I shouldn’t, but I don’t really see why not. I had lots of practice driving our old one, so I wasn’t afraid to take this one out. It handles well and it’s easy to drive. Who are you travelling with now? My friend Eva Rupp and her dog, Teddy. Eva was a full-time RVer for a couple of years, and she likes to be on the road. What do you like about RV life? I like meeting people, and I like setting my own timetable and routine. 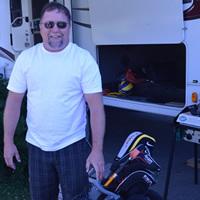 RVer Bruce McDonald of Edmonton likes the Fairmont Hot Springs area for its many golf courses, and the rest of his family love the hot pools.